Whenever my students have had to be redirected 3 times for the same reason, I have them complete a think sheet to stop and think about how they can fix their action. If it is a serious behavior (hitting etc) I have them do a think sheet after the first time. 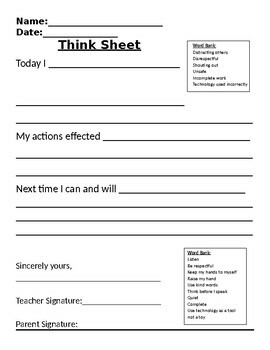 If it persists after the think sheet then it has to go home to get signed, if the student uses it as a tool to turn their day around, then it stays between us. If it is sent home and it comes back not signed, then the student has to call and explain what happened the following day, teaching honesty and being up front is the best way to go. I always follow these up with a positive call home about how they turned it around. If the student cannot turn it around, maybe a problem solving meeting would be helpful to have parents, child, and teacher work together to identify the issue and come up with a strategy to prevent future issues and in a way that everyone can work together as a team.